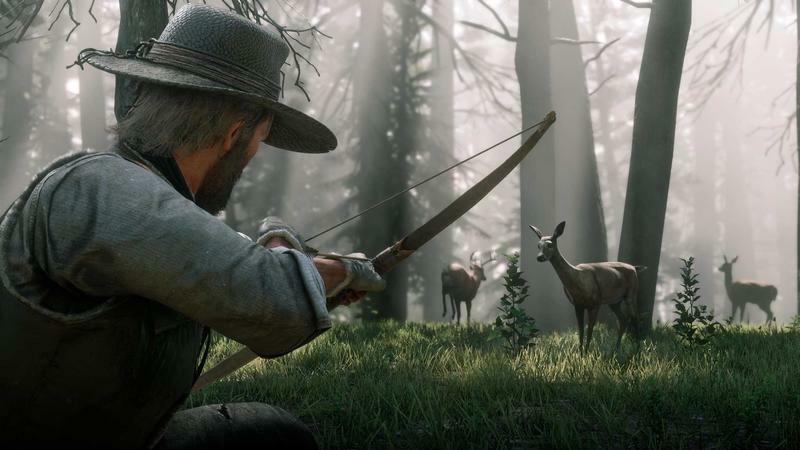 Trends in game design come and go, but one trend that's been sticking around for the last five years or so goes like this: Give a character a bow and arrow, make them hunt, and give them a list of things to craft from all the animal parts they collect. It's often fun, but very few of the games that allow this make it feel like a meaningful part of the world. Red Dead Redemption 2's in-depth hunting is one of the rare exceptions to this. It fits the character and the world the character lives in. I think back through all the games I've hunted in – Tomb Raider, Far Cry 3 and 4, and Primal, Red Dead Redemption, Horizon Zero Dawn, and more – and so often the hunting seems like a way to pad out the game. If you want to progress, you have to upgrade your gear. If you want to upgrade your gear, you have to hunt. But for the characters in many of these games, hunting doesn't quite fit. 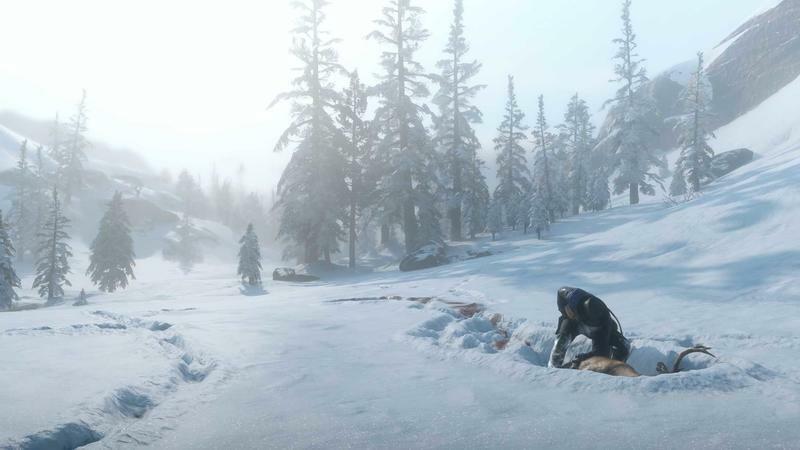 It definitely doesn't fit for any Far Cry protagonist, and Tomb Raider abandons its wilderness survival premise almost immediately. It kind of makes sense for Horizon Zero Dawn, but you can only shoot so many small game birds and raccoons. That brings us to the Red Dead Redemption series. Hunting in Red Dead Redemption II makes sense for the story, the character, and the world in a way it doesn't really in other games, or even in Red Dead Redemption. In the first Redemption game, our boy Johnny could shoot animals and skin them, but it didn't feel so fully of a piece with the game. The overall tone of the game itself was that of a spaghetti western. A Fistful of Dollars; The Good, The Bad, and The Ugly, and so forth. It was about fast horses, weird characters, loud music, and the twang of bullets as they ricochet. When John Marston would tool around shooting animals, it felt like shooting things for the sake of shooting them. John is kind of a dumbass. I love him, but the game is about how he's in way over his head as he tries to save his family. That guy, in that state, pausing to pop a few armadillos sounds as silly as the parent from Fallout 4 putting their frantic quest on hold to build a community instead of tracking down their missing infant. But Arthur? There's no question – hunting, skinning, and eating animals is part of his everyday life. There's processed food out there, sure, but the Dutch van der Linde gang is on the run from the law, and your ragtag crew is setting up shop in forest clearings and on lakeshores. Going into towns where your face might be decorating the walls of sheriffs and saloons just doesn't make sense. Especially when everyone in your group keeps an arsenal on their horse at all times. 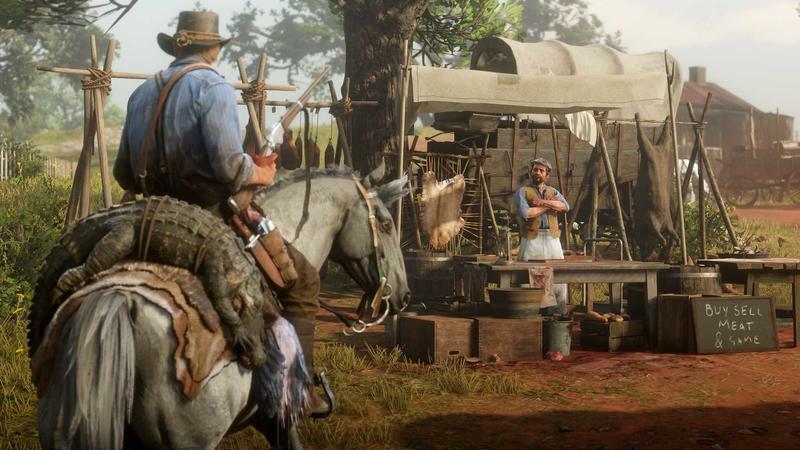 With Arthur as Dutch's right-hand man and a sort of reluctant caretaker for the group, he would absolutely be hunting on a daily basis to keep his people fed. Arthur's also a sad, frustrated man. Having grown up in Dutch's gang, he doesn't know a life without violence. But he keeps a journal, and talking to other characters reveals a man who buttons up his emotions because he's never been taught what to do with them. That he would want to venture out into the wilderness alone for days at a time absolutely makes sense. When I step away from camp to hunt or fish on my own, it feels like taking a breath and getting some space, especially when I can find a spot without a lot of traffic. 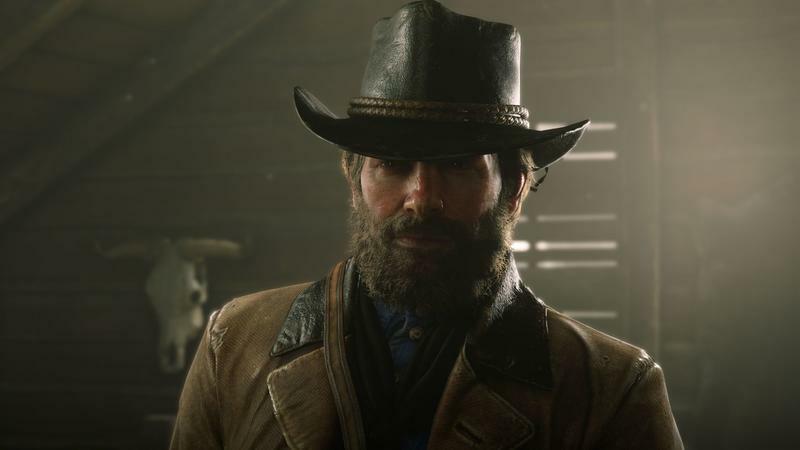 I get the feeling from the way Rockstar builds the character of Arthur that he would be out there for personal and group-focused reasons alike, and he'd have the time to do it. 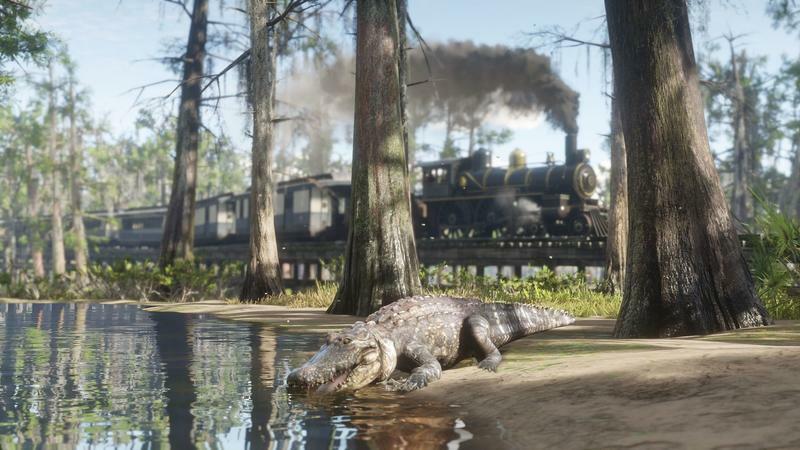 Red Dead Redemption II is set in a much more lush part of the country than the first game. I've spent a lot of time in grassy fields, thick forests, and even in swampy, stinky bayou. The world is absolutely teeming with life. When I turn on my tracker vision, I'll find myself surrounded by signs of recent life that I can track. Deer, turkeys, and other animals blink in the distance. Rabbits are zooming by constantly. With a kill strapped to the back of my horse (either Taylor Swift or Barry, The Fastest Horse Alive), I can then head into town to the butcher, find the trapper out in the woods, or go back to camp where a barely-tolerable man named Pearson awaits my return. Or I could strip the kill down to parts and set up camp, cooking it with herbs I've picked up to achieve different effects (not that different, admittedly). I can eat them on the spot or put them away for later, so I'm just riding around with a satchel of cooked animal parts flopping around at my hip. The trapper can build new clothing and gear, while Pearson can do some more primitive stuff like upgrading your satchel (to fit more meat) and make decorations for the camp out of leftovers like skulls and horns. The world of Red Dead Redemption II is a world in progress. Civilization is there, but it appears in fits and starts. Shipments of canned goods come from The Big City – but that's nowhere close. It makes sense that a lot of the people who live in these small towns would hunt because processed food just isn't widely available. Because people are making food, clothing, and gear from these animals, it stands to reason that they'd care what condition the pelts are in. So when I pick out a varmint rifle to take down one critter, and scoped rifle for another, it feels like I'm making a decision that a craftsman would make in choosing just the right tool for the job. The same goes for when I'm picking out a lure when standing at the side of a river or lake. I think back to John Marston, grimacing as he skinned beasts. He didn't want to be doing it. I didn't really, either. It was something I did to finish out a challenge. It was part of the game, but not part of the world. With Arthur Morgan, it feels right, and that makes me want to get out there, late at night or early in the morning, looking for the right creature, so that I can take aim and put it down in one shot. Disclaimer: We received a code from the publisher for Red Dead Redemption 2 and are playing on PlayStation 4 Pro.